STOP it. Please. Stop believing that humans have the right to demand the practice of exploiting other members of the animal kingdom, who are conscious and feeling. They share with us the capacity to suffer, sentience, a brain, pain receptors, a nervous system, faces with eyes, a desire to live. We should be able to empathize. And vegans have done just that. 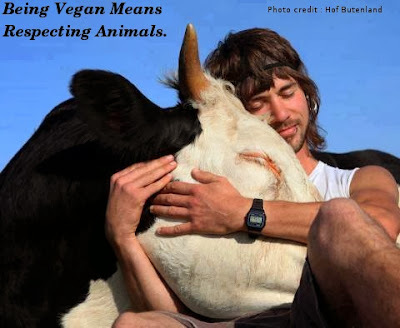 Vegans, through their own reasoning and empathy for others - are the pioneers who have proved that humans can live without intentionally being cruel and violent to perceptually-aware beings. This is a crime. Legal systems have always taken time to catch up with the progressive collective consciousness of that time period. At one time it was legal to own another human being as a slave - until it wasn't anymore. Owning nonhumans as slaves is legal now - until the day it won't be any more. There will be a time when it is not socially acceptable to harm animals, as it is now. The human race can advance to a more civilized, and less violent species. Adopting vegan living out of basic respect for fellow feeling animals is the best hope we have for a saner, healthier, more peaceful, more loving, and more sustainable planet - the one we all share. Our choices affect each other. Take that step up to being a part of the solution for what plagues planet Earth: oppression, slavery, violence, environmental degradation, global warming, hunger, etc. If humanity adopted a plant-powered diet, at least - we could heal our planet. 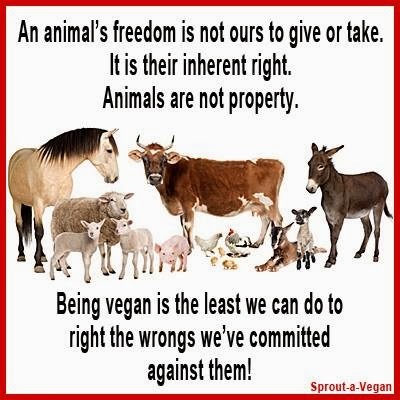 But I'm asking you - on behalf of my animal cousins - to be fair and give other animals what they are owed, by virtue of their sentience - their right to autonomy; freedom to live without humans using them as a resource. They are not things. They are "someones" that humans treat as "somethings" - and I feel compelled to speak the Vegan Truth. This behavior towards animals is wrong. Get with the times. 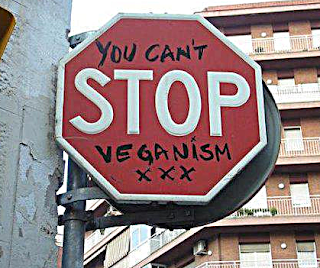 Say you're sorry by becoming vegan. After an initial learning period, it becomes second nature and easier than you think. Vegans are not extreme, fringe, weird or bad. They are not self-righteous; they are righteous towards other animal life. Vegans are merely showing basic respect. And there is "a right" and "a wrong". It's right not to cause needless suffering. It's right to care - to care enough to change your life, your perception - for a newer and better one than the one society handed to you. Step up into a whole new worldview. 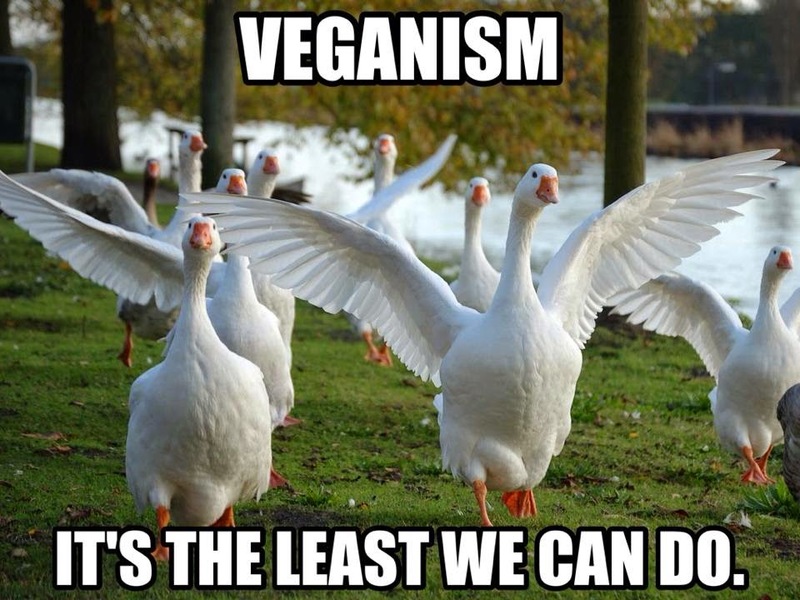 Veganism is a social justice movement open to anyone of any gender, age, sexual orientation, color of skin, atheist or theist, rich or poor, hippy or straight, liberal, conservative, or anarchist, lawyer, PhD, doctor or skateboarder, shop owner, unemployed, whoever! And vegans do come in every walk of life. We want to make history and change the world for the better, and there is nothing needed more than for you to join the ever-expanding vegan community. 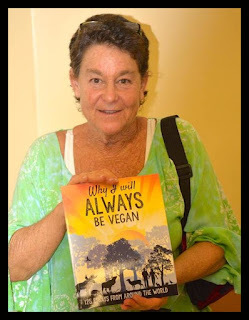 To learn more about the benefits of vegan living, how to be a vegan, how eating a plant-based diet is the best for human and planetary health, vegan nutrition, please visit Veganism; A Truth Whose Time has Come...my blog, written by an unwavering vegan of 35 years. In this post you will find living proof that humans CAN live vegan, long-term. Other vegan educational sites to start with: Gentle World, Vegan Starter Kit. 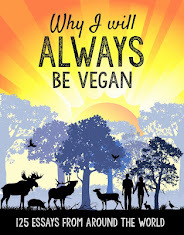 Finally, in this post, I have briefly responded to 60 comments and questions from nonvegans. Thank you so much for you posting,it makes me very proud to be a Raw Vegan even though it's been only over 1 year,. I dare to affirm that animals do have souls! If they can't talk, and act like humans can, that doesn't mean they don't have a soul, they are not robots moving and acting only because their anatomical structures! To the last anonymous person leaving a comment: I agree, I am fanatical when it comes to harming anyone sentient, when we can live just fine without intentionally harming anybody. Yes, anyone that is not vegan - IS a murderer of sentient beings; beings that have the same or similar capacity to suffer as you. I don't want to call you a murderer (only because it is socially acceptable presently to kill and violently assault animals). But hey, you said it. I happen to be a vegan for ten years now.. I blew my candles wishing that people who are not vegan yet start to open their eyes on the animal's suffering, the environmental problems being not vegan might cause as well as the benefits that being a Vegan can offer, to anyone. this was beautifully done...thank you! i've been vegan for 25 years. even tho i was always an "animal lover" and rescued dogs & cats & birds and gathered petition signatures for the clubbing of harp seals, i grew up in a family of hunters and regularly saw newly killed geese lined up on our patio, and even tho i cried every time i passed a "livestock truck" headed for the slaughterhouse, i still ate them...i still ate the tortured flesh and secretions of the beings i purported to care about. i never KNEW another vegetarian - much less vegan - as i was growing up... i don't know WHY the connection was not made. if someone had pointed the hypocrisy out to me - or if someone had shown me factory farm images etc at an earlier age, that would've done it. my own "switch" happened the day i opened up literature w/ images from a large animal org, and that was the end of my unconscious ways... what i just can't seem to understand, is how people - those who claim to "love animals", those who KNOW other vegans, those who've been PRESENTED w/ the visual and factual truth behind meat/dairy/egg production, those who are involved in fighting against other forms of injustice - can CHOOSE to remain blind and indifferent... being completely unaware is one thing, but CHOOSING to remain indifferent - and thereby a participant - is quite another...(i witness this all the time as i do a lot of my own vegan education/outreach)... shame on us as a species for all that we have done, all the unspeakably heinous crimes we have committed against our fellow earthlings... i am inspired by and grateful to ALL THOSE who give voice to the voiceless, and who work so tirelessly on their behalf... change IS happening! not fast enough, but it's happening. I really liked the message that was told in this post of yours, outstanding!! !